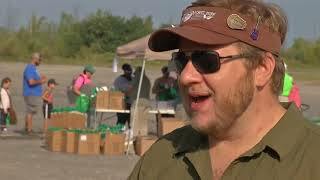 Penn Dixie tries for a Guinness World Record fossil dig. Phil Stokes explains. After earning two geology degrees from UB, Stokes obtained a PhD in geosciences from the University of Arizona. He jumped at the chance to come home when the position opened up at Penn Dixie. Located on the grounds of an old cement quarry in Hamburg, N.Y., the park attracted 18,000 visitors from 40 states and 18 countries in 2017. As schoolkids scrambled over the big piles of rubbled shale on a recent morning, it felt like a special place. We asked Stokes to give us some fossil-hunting tips. For small invertebrates, great places are along water where erosion is taking place: creeks, rivers, lakeshores. Also road cuts and cliffsides along highways, where dynamite has been used and excavators clear away material—anyplace where layers of shale or limestone are exposed. Note: Along the Thruway, it’s illegal to stop and collect rocks. But it’s usually OK on smaller, local roads. Bring a trowel, a little garden rake, a small hammer and a bag. You might be out all day in the sun and heat, so you also should bring plenty of water and wear a hat and sunscreen. Cloudy weather is ideal for fossil collecting. If it’s bright out, it’s sometimes hard to see contrasts in the rocks between a very shiny surface and dark shadows where fossils may be embedded. Ideally you want everything to appear as uniform as possible so you can spot the subtle differences in color and texture. When hammering and digging, be careful not to break the fossil, and don’t overhammer. Resist that urge to chip off just one more piece of rock. The delicate hand finds the best fossils.